When complete, this online catalogue will comprise more than 300 paintings divided into 7 sections: history paintings, landscapes and animals, self portraits, portraits of family members, genre scenes and portraits. This catalogue does not propose any single evaluation, however authoritative, by any single party as to the authenticity of any painting. Rather, it should be considered an overview, or a distillation of those works which seem for the most part generally accepted as authentic works painted by the artist's hand. In fact, it has proved particularly vexing to establish a definitive catalogue of Rembrandt's oeuvre. Many works are poorly preserved and have been overpainted by later hands and number of very important attributions are still disputed. The situation is also complicated by the fact that Rembrandt took on an unusually high number of apprentices in order to insure him a significant income. Some of these apprentices were sufficiently talented as to emulate Rembrandt's own painting and their best works are arduous to distinguish from Rembrandt's own. 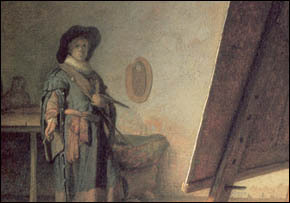 His work was also imitated by other talented painters as well both during and after Rembrandt's lifetime. Every effort is being made to acquire the best quality high resolution images, which, however, is not possible in all cases. Petronella Buys, Wife of Philips Lucasz.